The affordability, fairness and safety of housing is a community issue for Greensboro and for College Hill. And it’s an increasingly serious one. 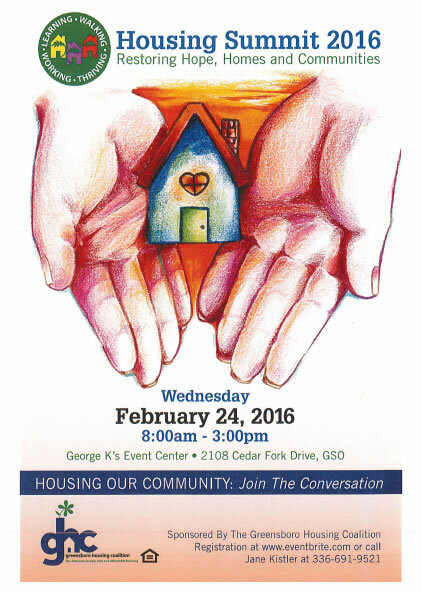 The Greensboro Housing Coalition’s annual summit will include breakout sessions on community revitalization, universal design and making homes healthy (asthma partnership demonstration). Keynote speaker: Frank S. Alexander, Sam Nunn Professor of Law, Emory University Law School. Mr. Alexander is co-founder and senior advisor of the Center for Community Progress (www.communityprogress.net), an organization that helps communities integrate vacant, abandoned, and blighted properties back into their economic and civic life. This entry was posted in Events and tagged affordable housing, community revitalization, fair housing, Greensboro Housing Coalition, housing, safe housing. Bookmark the permalink.